Roy Wagner’s work deals with two fundamental issues in anthropology: how to describe difference, and where to place it in anthropological discourse. His discussion and displacement of anthropological concepts such as ‘group’ and ‘culture’ in the 1970s and 1980s have arguably encouraged a deconstructive undertaking in the discipline. Yet Wagner’s work, although part of the radicalizing move of the 1970s and 1980s in anthropology, was until some years ago not a central reference for anthropological theory. 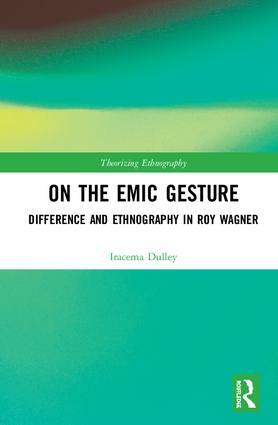 The question Dulley asks throughout her engagement with Wagner’s main essays is whether it is possible for the emic gesture to account for difference within difference without falling into the closure of totalization. Wagner’s work contains this potentiality but is hindered by its very foundation: the emic gesture, in which difference is circumscribed through a name that others. If this gesture is one of the pillars of anthropology, and one that allows for the inscription of difference, the reflection proposed in this book concerns anthropology as a whole: How can one inscribe difference within difference? Dulley argues that this can only be accomplished through an erasure of the emic. Offering a comprehensive discussion of Wagner’s concepts and a detailed reading of his most important work, this book will be of interest to anyone who wishes to reflect on the relationship between ethnography and difference, and especially those who in various ways engage with the ‘ontological turn’. As the book reflects on how Derridean différance can be appropriated by anthropology in its search for subtler and more critical ethnographic accounts, anthropologists interested in post-structuralist theory and methodology will also find it useful. Iracema Dulley is Research Affiliate and Affiliate Professor of Anthropology at the Department of Social Sciences of the Federal University of São Carlos, Brazil. Prior to this, she held a post-doctoral visiting fellow position at the London School of Economics, UK, a researcher position at the Brazilian Center for Analysis and Planning, and a visiting professor position at the State University of Campinas, Brazil.